There's a trillion reasons why the Winklevoss twins are in love with Bitcoin. The brothers, known for their legal battle with Facebook (FB) founder Mark Zuckerberg, believe the controversial cryptocurrency is the payments network of the future. That's despite Bitcoin's 60% plunge in 2014. They predict Bitcoin's market capitalization could easily skyrocket to at least $400 billion, or roughly the combined size of modern day payments companies like American Express (AXP), Visa (V), MasterCard (MA) and Western Union (WU). But the Internet entrepreneurs are taking it one step further. They believe Bitcoin could one day morph into a gold-like asset class -- or even surpass it. "If Bitcoin is a better gold or seen as a type of gold-like asset, then it could be in the trillions on a market cap," Tyler Winklevoss told CNNMoney. "We do feel those are very real possibilities." Reaching over $1 trillion in market cap is hard to fathom, especially because Bitcoin's current market cap is less than $4 billion. Many skeptics remain convinced Bitcoin was a bubble that will soon die out. Jeffrey Gundlach, the new so-called "bond king," recently said Bitcoin is "on its way to being relegated to the ash heap of digital currencies." Buying opportunity? Don't tell that to the Winklevii, as they are sometimes called. The twins are huge backers of Bitcoin and stand to profit handsomely if their vision comes true. They're not worried by the currency's recent glitches or its price decline. One Bitcoin is currently worth about $265 -- a big drop-off from its peak of more than $1,200 back in late 2013. "It's a buying opportunity. We've never sold a Bitcoin. We're in it for the long haul," Cameron Winklevoss said during a presentation at ETF.com's Inside ETFs Conference. 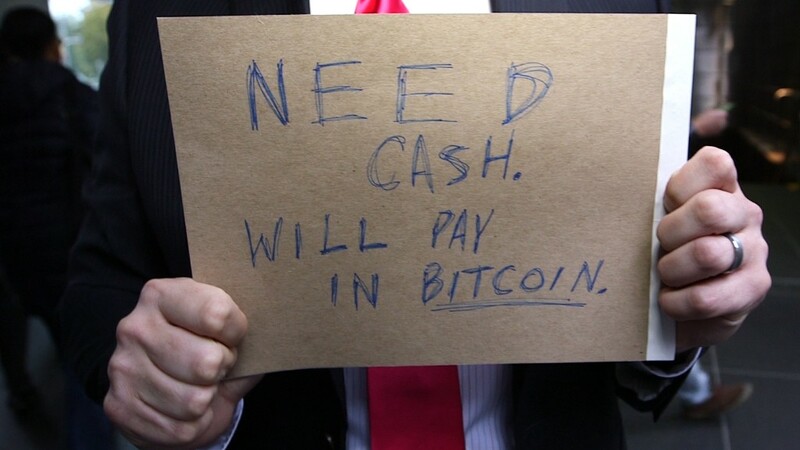 But the WInklevoss twins realize Bitcoin needs help. The 2014 bankruptcy of Mt. Gox, a Tokyo-based Bitcoin exchange, has raised questions about the currency's security. Price declines and volatility also spook some potential investors. "People get fixated on the cost," Cameron Winklevoss said. "It's going to have lots of gyrations, but it's new and you have to bare with it." Improving the system: To help Bitcoin get through its growing pains, the twins are building infrastructure aimed at legitimizing and securing the currency. Last week they unveiled Gemini, a Bitcoin exchange for U.S. consumers. They hope it will become the "Nasdaq of Bitcoin." They may have been beaten to the punch by Coinbase, a U.S.-based Bitcoin exchange that opened on Monday with backing from the likes of the New York Stock Exchange. Second, the Winklevoss twins are awaiting regulatory approval for the first exchange-traded fund holding Bitcoins. Just like GLD (GLD), the popular gold ETF, the fund would trade securities based off of Bitcoin. At least one ETF veteran believes the idea of a Bitcoin ETF may have some merit. "The ETF structure is allowing more and more asset classes to become investable -- and Bitcoin is one of those," Dodd Kittsley, head of ETF strategy at Deutsche Bank, told CNNMoney. "This could be a great potential solution. We've seen it in less liquid markets like fixed income." The twins believe such an ETF would appeal to gold bugs because Bitcoin, just like gold, can be used as a hedge against inflation. They say Bitcoin is more durable, divisible and affordable than the yellow metal. "If you like gold, there are many reasons you should like Bitcoin," said Cameron Winklevoss. Of course, gold has been around as an asset class for thousands of years. By comparison, Bitcoin is still just a baby. "Wars have been fought over gold. I don't know if the same is going to be said about Bitcoin," said David Mazza, head of research at SPDR ETFs at State Street Global Advisors.